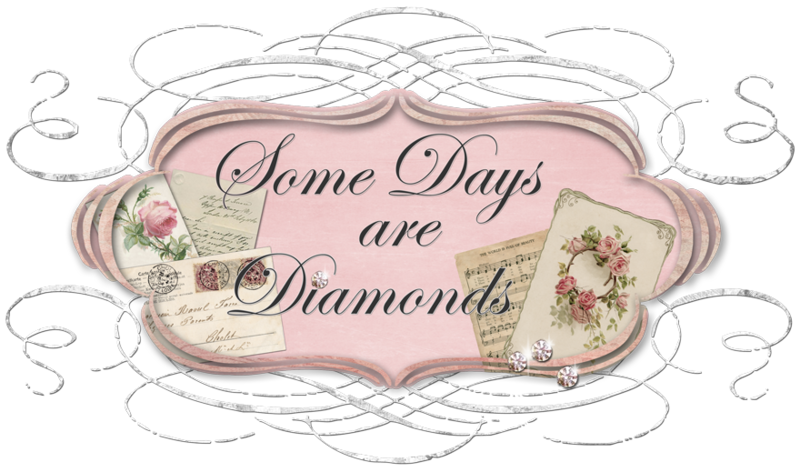 Some Days Are Diamonds: Let the Sun Shine In! Oh my goodness! We have had a cold and rainy week this last week and I have loved every single minute of it! Yes - even taking the dogs out when it was 28 degrees, or pouring cats and dogs. I can get their little coats on and off them pretty quick now! Jorja on the left - Harley on the right. "You'd better be giving us treats for embarrassing us like this Karen!" "Of course, me being the Princess Girl brat dog, I have TWO outfits. I love my pink rhinestone sweater the best!" OK, enough of those two. So last weekend - just in the nick of time - I accomplished the last of my Autumn chores. I got my tree trimmer out here to get my yard in check. I usually have them trimmed by late October but for some reason this year time just kind of got away from me. The inside of my house was dark and COLD! Here are some before and afters! Whew! We have this Pepper tree right in front of the living room window. Great shade in the summer! And we also have three huge Sycamores. The Sycamores just get out of control. on either side of the driveway? They were the most annoying trees. Their roots were the WORST! They HAD to go! After! sigh. Let the sun shine in!!!! And those three nasty lovely trees are HISTORY! Yup, we'll just do it all over again next Fall. But that's OK.
rain this past week and we needed it desperately! Our elevation is high for our town and we have quite a view. (Well we don't - we are on the wrong side of the street. at the clouds just racing across the sky. What a BEAUTIFUL day! Everything is so clean! This rain was a HUGE gift from God. understand it might put some people in harm's way. But pray I did. Lots! I'm sending out a little reminder to everyone that the final Doors of Welcome will be this coming Tuesday - December 15th. I can't wait to see how everyone spruces up their doors. So be sure to spread the word, and it isn't too late if you still want to join in!! Have a wonderful day!!! I'm going to get going on my wrapping! The trees just look sad with no gifts under them! Oh my, those are the cutest little faces. They are just the cutest!! I love their little coats. I just love dressing mine. Oh my goodness they are sooooo precious! Lovr the coats. Have I told you how much they remind me of my former dogs Teddy and Bear? Same coloring. I still miss them so much after six years. One day we will get another Shih-stzu. The timing just hasn't been quite right yet. See you at the doors of welcome! Those are the cutest little puppies in their outfits. Precious and it did look like they were trying to talk to us! Love your house with or without the trees being trimmed:) The view is awesome. I have my Doors of Welcome ready! Can't wait, it is one of those days when I get a record number of comments, Love the comments:) Have a blessed day dear friend! The pups are darling. I posted a picture of my pup today too. We've had too much rain, so we prayed it would stop and it did...the farmers are still getting crops out of the fields, very late this year. Your home is beautiful! Oh the pups look so cute in their winter coats. Wow, what a difference a little trim makes on the trees. I do have to let you know that I'm going to have to back out of Doors of Welcome again. My door just doesn't look too welcoming. I'm looking forward to seeing what everyone has done...maybe get ideas for next year. how or what do I have to do to join???? Your house looks like almost a mansion to me! How big is it? Seems to me to have a great view, but then I'm looking at photos. I just did much-needed yard work all afternoon myself. I shall try and come up with something on some door for Tuesday. Can't promise; but will try! What a cute post! I cannot imagine how you got them into their 'coats'. And what a lovely, lovely yard. You are blessed. Wanted to let you know that I am joining in with the Christmas Doors of Welcome, have linked to your blog. Thanks for hosting such a fun tour! I love your dogs! and your home is beautiful..
Oh what cuties you have there! They're just adorable. I appreciate your visit to my blog today as well. I had a wonderful trip and really enjoyed seeing the NYC sights. Especially at Christmas. Karen, I just love your house!!! You live in such a beautiful area with the soft hills around! Gorgeous!!! I hope to come back to CA for vacation one day. I'm having withdrawel symptoms, LOL. A Little Bit of Christmas . . .